The colours in Case File #89 over at CSI this week are bright but soft shades of peachy orange, buttery yellow, seafoam, celery and teal - a beautiful combination which I probably wouldn't have thought of, but really enjoyed working with. I also experimented with some of the goodies in my August Mixed Media Kit from FrogDog, got very messy, learned some stuff, covered up some booboos, carried on regardless and had a great time! CSI Mastermind Debbi Tehrani has found another interesting Scene for us to look into this week. From this image, Debbi takes the colours, as well as inspiration for design elements and journaling prompts. CSI = Color, Stories, Inspiration. 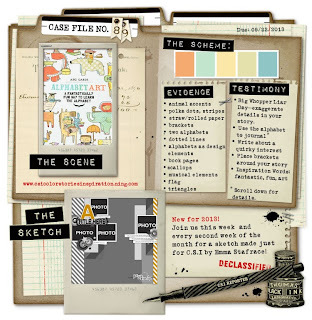 In order to solve the case, you need to create a scrapbook page including all five colours in the scheme, at least two items from the evidence list and at least one from the testimony list. 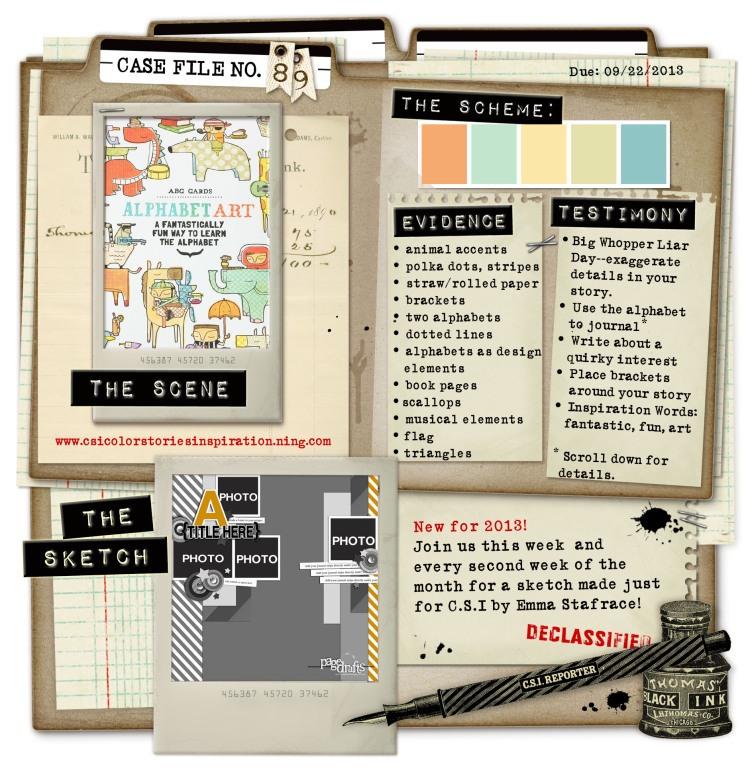 Every week, there is also a new set of CSI Coordinates specially designed for us by the talented Michele Singh - these are printable images, words, journaling spots and patterned papers which CSI members can download for free - pretty cool! As you can see, because this is the second week of the month, we also have a sketch by the fabulous Emma Stafrace at Page Drafts. I thought this one would be ideal for a handful of tiny sweet photos of my great-niece Kerrilouise when she and her Mum came to stay with me for a while back in 2007. Close-up of glitter paste - wonderful stuff! Once I was happy with the background (or once I could stop myself tinkering with it!) I built up my layout using the sketch as a guide. The pictures were mounted on contrasting paper with distressed edges. Pretty word stickers, polaroid frame, mesh ribbon and a coil of knitting wool tied in a bow were tucked behind and around them to add interest. I made a couple of tulle roses and clustered them together with flowers from my stash, adding some adhesive gems and pearls and Glitter Paste for a bit of bling. Orange Inka Gold gave me a lovely soft sheen of colour all around the edges of the page. The letter "B" was hand cut then distressed and added with pop-dots for dimension. The "bootiful" was a happy accident - created by sticking down fabric letter stickers, drawing around them, deciding I didn't like them, peeling them off and filling in the outlines with white marker pen. The Sketch: brilliant sketch to work with, just changed up a couple of things. The Scheme: all the colours are there, with some deeper orange as an accent colour plus black/white. The Evidence: polka dots (flower, buttons, paper); alphabet as part of my design (the large B, the Letraset); two different alphabets (actually several). "B is for ... Bottle, Bean Bag, Blanket, Bubbles, Bath in the sink ... bootiful. Kerrilouise staying with Great Aunt Auntie 2007 Norwich." Check out the amazing work in the Gallery at CSI to see how everyone has solved this case.